The UIDAI has maintained the Aadhaar enrollment centers across in the country in all states in all circles in district wise to provide all Adhaar services and the centers running under various private agencies, citizens can visit the nearest enrollment center to get all Aadhaar services like change or modify Aadhaar Data, Bio-metric Fingerprints, and Iris Update. 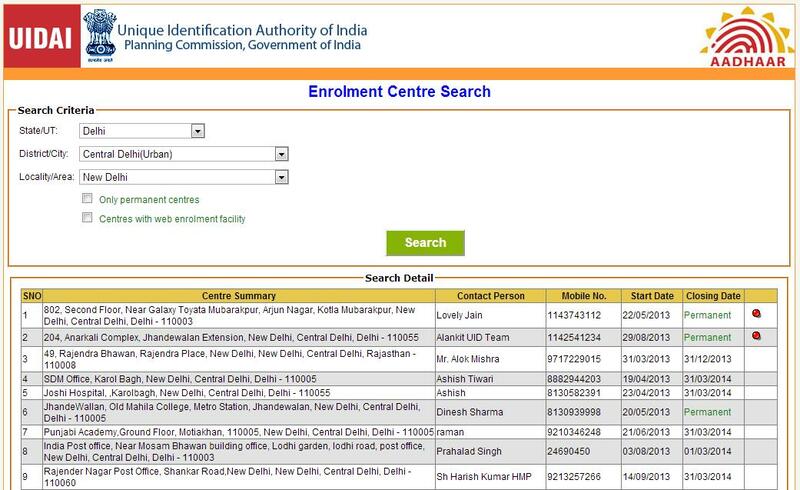 How to Locate Aadhaar Card Enrollment Center? The Unique Identification Authority Of India has started the Aadhaar Appointments portal to get Appointment to enroll new Aadhar or Make Changes in Aadhaar Data or any Aadhaar related Services. The Citizen of India who needs to get new Aadhaar or Modify their Aadhaar Data they can visit nearest enrollment centers to get services. We have provided useful tips to get UIDAI Appointment from your nearest enrollment center, everyone can follow to fix your appointment. Now Select your State, District, Sub-District (Circle or Mandal) and VTC(Village Town City). Now enter the Verification Code and Search for displaying your nearest Aadhaar Permanent or Temporary Centers list with Contact details of central authority. Now Contact to center and get an appointment to complete required Aadhaar Services. The UIDAI Aadhaar Appointment services available with searching your PIN code and Search box also. The Aadhaar Centers available in 3 types of Verified Enrolment Centres, Enrolment & Update Centres and the services available at nearest common service centers. I have Searching for Area Aadhaar Center, But it is not working, Now What to do I do? Each Area has multiple centers, find another center to get services and you can get all adhar services across in the country there is no issue. My Finger Prints are not Marching, I Will Update at enrollment Center? Sure, you will update all biometrics to your Aadhaar Number from the Enrollment and Update Center. My Self Service Aadhaar Update is not processed, Now I will update at Update center? Yes, if you have faced any error or denied your request, you can visit nearest update center to update all data in your Aadhaar Card, after successfully downloaded your data you can download e-Aadhaar Card online with latest details. I have lost my Aadhaar Card and Aadhaar Number, How to get my Aadhaar Details or recover of Aadhaar Details? If anyone will have lost or forgotten Aadhaar Number, they can visit nearest Aadhhaar Center to recover Aadhar Details with using fingerprints and Irish Biometrics, then you will get a copy of Aadhaar Number from the Center, now you can save your aadhaar details at your mobile phone through mAadhaar App please download and carry.